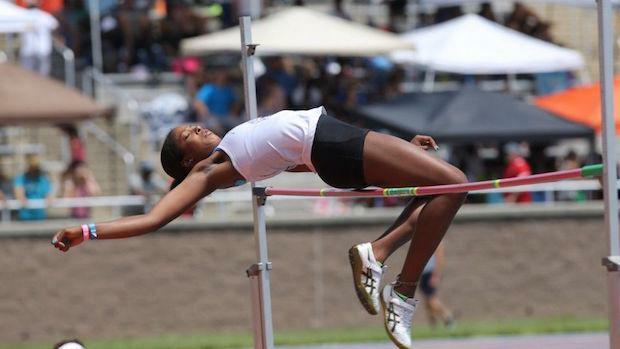 The moment Vashti Cunningham arrived, the girls high jump wasn't the same. The Bishop Gorman graduate and daughter of NFL quarterback Randall Cunningham jumped for the first time as an eighth-grader in 2012, hitting 5-8, then she wouldn't stop going up. She went 6-0.25 the following year, then 6-2 as a sophomore, then a national record 6-5.25 as a junior and then for good measure, 6-6-25 indoors as a senior. In some ways, Cunningham--much like Mondo Duplantis this past season--set the bar remarkably, and perhaps impossibly, high. Only one high school girls athlete not named Vashti Cunningham has cleared a higher mark indoors than 6-1.75, and Lisa Bernhagen achieved that feat in 1984. Outdoors, just four athletes have cleared higher than 6-1.5, with Inika McPherson, Toni Young, Amy Acuff and Cunningham all accomplishing that feat. But this season, unlike many others, the high jump remains incredibly talented. While no girls athlete broke 6-feet indoors a year ago, that already has changed in 2019. Northwest (MD) senior Taylor Wright went 6-feet at the Ed Bowie Classic in December, and potentially more than a handful of others have a chance of hitting that mark this indoor season. That list includes Noblesville's (IN) Shelby Tyler, Rutherford's (NJ) Jenna Rogers, Myers Park's (NC) Addie Renner, Westbrook's (ME) Nyagoa Bayak, Valor Christian's (CO) Anna Hall and Pendleton's (SC) Kamiya Dendy. Check below for the all-time high jump list indoors, progression from 2018-2019, and the top returners for the 2019 season.